New range of Mercedes-Benz X-Class Accessories now in stock for your pick up. 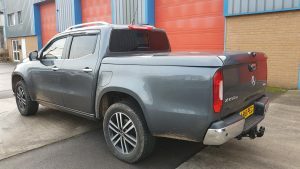 The Sports Lid tonneau rear cover for the X-Class can be selected with or without Stainless Steel Styling Bars. Furthermore the rear lid comes with optional luggage rails. 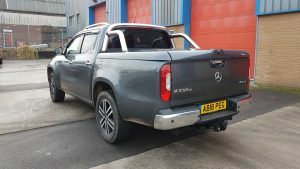 Add style, presence and practicality to your X-Class with this flat load back cover. Opening at 45 degrees it will offer protection to your load but still allow full access to the cargo area. The Mercedes-Benz X-Class Sports Lid back also includes a two tier locking system. Subsequently this offers maximum security against forced entry. Finished off in the X-Class colour code of your choice the stylish Sport Lid will compliment your X-Class styling perfectly. Pegasus 4×4 back this product with a market leading 3 year parts warranty. Please click here to view the full range of Mercedes-Benz X-Class Accessories.